The King or Queen of the kingdom lives in the palace. Only one palace can exist in your realm at a time. Also the palace is the only building where you can proclaim a village to be your capital. When a Palace is already built in a village, the residence cannot be built there and vice versa. 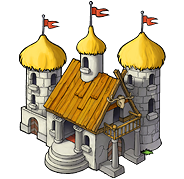 A Palace can train three settlers/settlers/settlers or one chief/chieftain/senator at level 10, 15 and 20 for settling or conquering new villages as described in the new villages page. The Palace is the only place where you can proclaim a city to be the capital. The capital cannot be conquered but completely destroyed by catapults. Additionally, this is the only village where a stonemason's lodge can be built and the only village where resource tiles can extended beyond level 10. The palace can be completely destroyed regardless of how many villages you have.